Authorities have arrested a third man in the slaying of former boxing champion Vernon Forrest, Atlanta police said Thursday. U.S. marshals took Charmon Sinkfield into custody Wednesday night after he went through a roadblock on Interstate 20, police said. He “attempted to conceal his identity by wearing a wig,” police said in a statement. Sinkfield faces charges of murder, felony murder, aggravated assault, possession of a firearm by a convicted felon and possession of a firearm during the commission of a felony, police said. Forrest, 38, was shot and killed July 25 in southwest Atlanta. The former boxer was returning from the gym after a late workout when he and his godson stopped at a gas station, according to Charles Watson, Forrest’s longtime friend and manager. While Forrest was getting gas, a man snatched his wallet out of his hand after asking him for money, said Watson, who spoke last month to police and the godson. Forrest chased the suspect, and gunfire was exchanged, police told CNN affiliate WSB-TV in Atlanta in July. Last week, police arrested Jquante Crews, 25, who authorities say was the alleged driver. Crews was arrested August 5 in College Park, just south of Atlanta. He was taken into custody without incident, police spokesman James Polite Jr. said. Crews faces charges that include felony murder, aggravated assault, armed robbery and possession of a firearm by a convicted felon, according to Polite. Demario Ware, 20, turned himself in to police August 4 and is being held on charges of murder, armed robbery and aggravated assault, police said. Forrest was the International Boxing Federation welterweight champion in 2001, the World Boxing Council welterweight champion in 2002-2003 and the WBC light welterweight champion in 2007-2008 and 2008-2009, according to the BoxRec Web site. 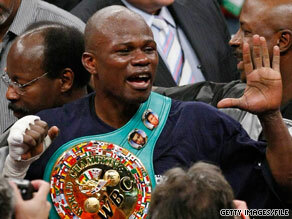 He was named the World Boxing Hall of Fame fighter of the year in 2002, according to BoxRec.